An interdisciplinary team of physicists and geologists led by the University of Pennsylvania has made a major step toward predicting where and how large floods occur on river deltas and alluvial fans. In a laboratory, researchers created a miniature river delta that replicates flooding patterns seen in natural rivers, resulting in a mathematical model capable of aiding in the prediction of the next catastrophic flood. The results appear in the current issue of Geophysical Research Letters. Slow deposition of sediment within rivers eventually fills channels, forcing water to spill into surrounding areas and find a new, steeper path. The process is called avulsion. The result, with the proper conditions, is catastrophic flooding and permanent relocation of the river channel. The goal of the Penn research was to improve prediction of why and where such flooding will occur and to determine how this avulsion process builds deltas and fans over geologic time. 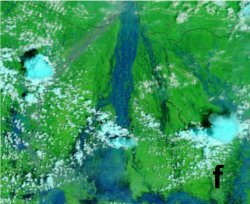 Research was motivated by the Aug. 18, 2008, flooding of the Kosi River fan in northern India, where an artificial embankment was breached and the resulting floodwaters displaced more than a million people. Looking at satellite pictures, scientists from Penn and University of Minnesota Duluth noticed that floodwaters principally filled abandoned channel paths. Meredith Reitz, lead author of the study and a graduate student in the Department of Physics and Astronomy in Penn’s School of Arts and Sciences, conducted a set of four laboratory experiments to study the avulsion process in detail. Reitz injected a mixture of water and sediment into a bathtub-sized tank and documented the formation and avulsion of river channels as they built a meter-sized delta. The laboratory experiments showed flooding patterns that were remarkably similar to the Kosi fan and revealed that flooding and channel relocation followed a repetitive cycle. One major finding was that the formation of a river channel on a delta followed a random path; however, once a network of channels was formed, avulsion consistently returned flow to these same channels, rather than creating new ones. An additional important finding was that the average frequency of flooding was determined by how long it took to fill a channel with sediment. Researchers constructed a mathematical model incorporating these two ideas, which was able to reproduce the statistical behavior of flooding. The authors derived a simple method for estimating the recurrence interval of catastrophic flooding on real deltas. When used in conjunction with satellite images and topographic maps, this work will allow for enhanced flood hazard prediction. Such prediction is needed to protect the hundreds of millions of people who are threatened by flooding on river deltas and alluvial fans. The work could also help in exploration for oil reservoirs, because sandy river channels are an important source of hydrocarbons.